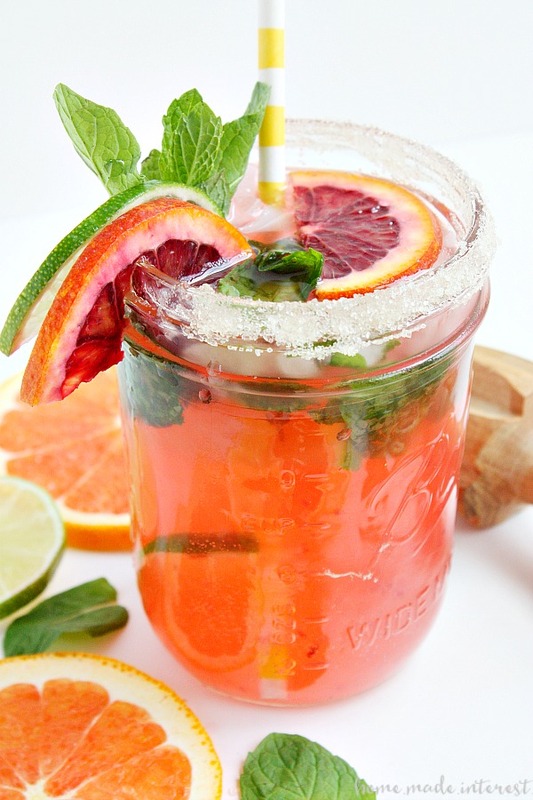 Blood Orange Mojito - Home. Made. Interest. 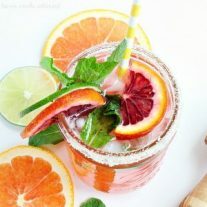 This Blood Orange Mojito recipe uses blood oranges and a little mint to make a drink that is beautiful and delicious. When the weather gets warm I trade in snuggling on the couch with a blanket and a glass of wine, for sitting outside on the deck sipping a fruity drink. Ok, I don’t really trade in that glass of wine, BUT I am much more inclined to try something different, especially if it involves fresh fruit. My current favorite is this Blood Orange Mojito. Doesn’t it just look like a little bit of sunshine in a glass? I like mojitos before I tried this one but this one blows the traditional one out of the water. 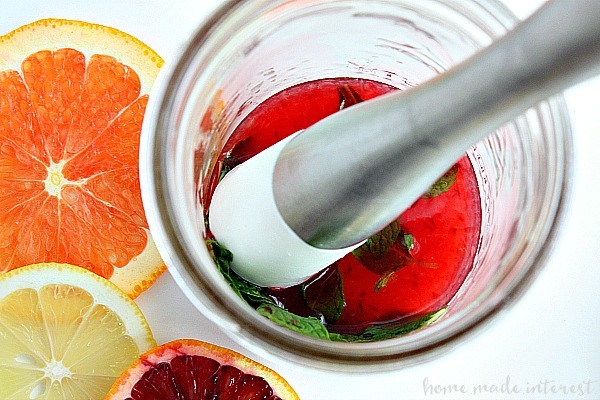 I love the flavor of the blood orange juice mixed with the mint and lime. It’s so bright and refreshing, it just makes the perfect summer drink. It’s pretty darn easy to make too. You just pour your blood orange juice, lime juice, and simple syrup into a glass, and then you toss in some mint leaves and use your muddler to smash them. This bruises the leaves and lets the mint flavor out. I feel like mint is what makes a mojito special. I mean there are lots of drinks out there with citrus juices and rum, but the crushed mint mixed with those two makes it something totally unique. 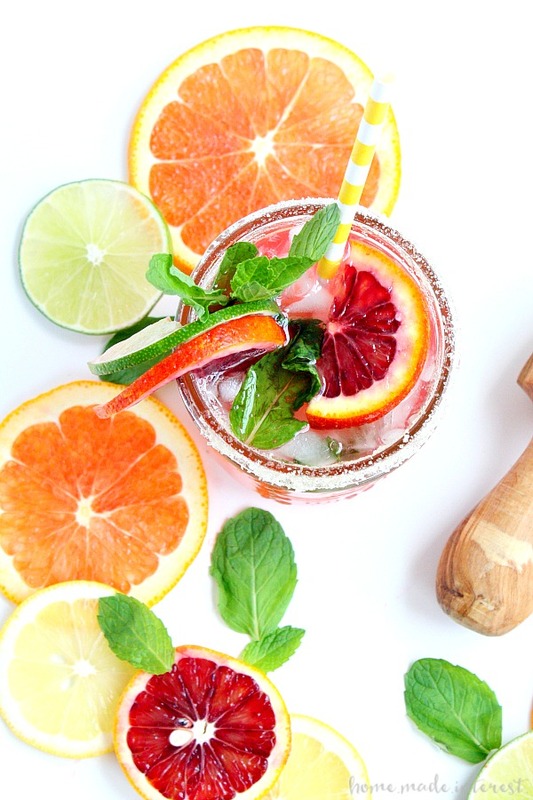 Blood oranges and a little mint make this Blood Orange Mojito beautiful and delicious. Pour the blood orange juice, lime juice, and simple syrup into a glass. Add your mint leaves and crush them with a muddler. Add light rum and fill the glass the rest of the way with seltzer water. Garnish with blood orange slices, and mint. This sounds like such a refreshing drink. The weather has been warm so I am getting thirsty. Not only does it sound delicious, the pictures are beautiful! Just letting you know I will be featuring your cocktail on Best of the Weekend, tonight! Hope to see you back with us again!